This recipe is from my husband, Chef Martin. 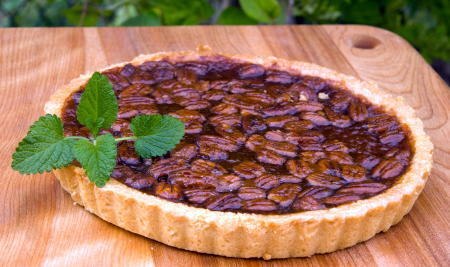 It is a French style tart, so using a shallow tart pan works best here. It’s a straight-forward decadent dessert that works well for cold winter nights! He likes it with half macademia nuts and half pecans, but you can use all pecans if you prefer. Preheat oven to 375F (180C). If necessary, move one rack to the bottom of the oven. Roast nuts till they are golden brown, about 3-4 minutes. Roll out your pastry to approximately 1/4 inch (0.5 cm) and line your tart pan with it. Brush beaten egg on pastry shell(this helps seal the crust). Pre-bake the empty shell for 8 minutes. Set aside to cool. Melt chocolate in double boiler or microwave. Let cool.Warm the corn syrup, add the melted chocolate, vanilla and eggs and stir. Place the nuts in your shell and pour your batter on top of the nuts. Bake tart at 375F (180C), on the bottom rack so the bottom crust cooks nice and crispy. Serve in small slices, with ice cream, whipped cream or Greek yogurt.